Most of us think that the defining element of the frontier was the wilderness. In fact, the most important thing on the frontier was the people who bravely came out to face the wilderness. It is also true that whenever people get together, whether in the wilderness of the frontier or in more civilized environs, pretty soon they will begin telling stories, and it will not take long before those stories begin to test the limits of believability. Which is not to say they become fiction or lies, but sometimes the truth can get a bit stretched. Stretch it far enough, and the story becomes a Tall Tale. Just because a story gets labeled as a Tall Tale does not necessarily mean that it is a myth or legend. The stories used on the WSM series Tall Tales were actually based on historical stories from Tennessee history. Whether tall tales of history lessons, WSM Nashville is a good source. It may not be obvious to people who grew up in the Midwest or on the West Coast, but in colonial times, Tennessee was the frontier and the edge of the wilderness. Even when the Nation began Westward expansion in earnest, there were still areas in the hills of Tennessee that were effectively cut off from civilization. The broadcast of WSM has been a "clear channel" station reaching most of North America (at least during the late night hours) since 1932. The station was an NBC affiliate and belonged to the National Life & Accident Insurance Company for most of its history (WSM stood for We Shield Millions, the company's motto). 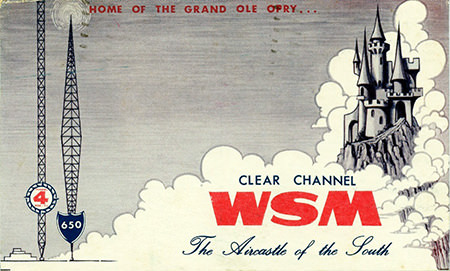 WSM was the original home of the Grand Ole Opry program, which got its name when "Judge" George D. Hay told audiences of the WSM Barn Dance that they were going to hear some "Grand Ole Opry Music" after NBC finished broadcasting Grand Opera on The Music Appreciation Hour, December 10, 1927. The Opry broadcast from the WSM studios on the fifth floor of the National Life building until 1934, by which time there simply was not enough room for all the fans who wanted to see the show. The show moved to the War Memorial Auditorium and the Ryman Auditorium in 1943. Tall Tales features a narrator, a folk singer, a "yarn spinner", and actors to present stories from the history of Tennessee. Some of the tales include the breakaway State of Franklin, memories of the Marquis De Lafayette who rode with George Washington and later visited Tennessee, the earthquake of 1811 when the Mississippi ran backwards, Davy Crockett and how he sought a wife, the story of Jenny Lind and P.T. Barnum, Admiral Samuel Powhatan Carter, and many others. The stories on Tall Tales may not stretch the imagination as much as a story about a huge lumberjack whose best friend is a blue ox, or a "steel drivin' man" named John Henry, but they are every bit as entertaining! Be the first to comment on "Tall Tales"